When Steve Jobs found out about Windows, he went ballistic. "Get Gates down here immediately", he fumed to Mike Boich, Mac's original evangelist who was in charge of our relationships with third party developers. "He needs to explain this, and it better be good. I want him in this room by tomorrow afternoon, or else!" "And, to my surprise, I was invited to a meeting in that conference room the next afternoon, where Bill Gates had somehow manifested, alone, surrounded by ten Apple employees. I think Steve wanted me there because I had evidence of Neil asking about the internals, but that never came up, so I was just a fascinated observer as Steve started yelling at Bill, asking him why he violated their agreement." "... 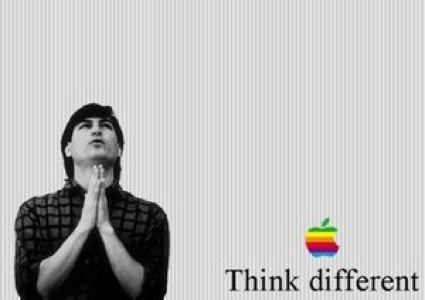 He (Jobs) was trying to get them (MSFT) to forget about the OS business, since the applications business would be much bigger total dollars. He said, "It's not that I don't trust you, but my team doesn't trust you. It's kind of like if your brother was beating up on my brother, people wouldn't say it was just your brother against my brother, they would say the Gates are fighting with the Jobs." 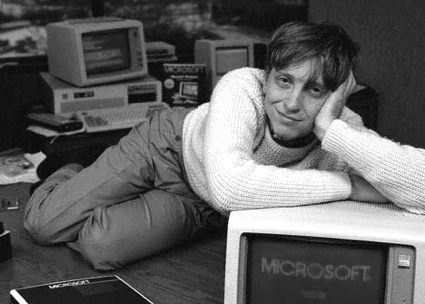 Bill responded that "No Steve, I think it's more like we both had this rich neighbor named Xerox, and you went in to steal the TV, and found that somebody else had stolen it. So you say, "hey, that's not fair. I wanted to steal the TV". All enhancements added by TinyTalk plc. PS: The differences between LISA/MacOS and DOS/Windows - despite everything that respective fans suspect - are mainly based in the ISAs (instruction set architectures) implementation and memory management of the original 16- and 32bit architectures of Intel and Motorola respectively. And then the overall cost of those architectures and in turn with Mr. Gates' business oriented preference of Intel and IBM. There was also a corresponding large difference in SW philosophy of which MSFT's was more modern and less performant than AAPL's (bytecode, virtual machines, portability, high level languages vs. pragmatic handcrafted "small is beautiful" Motorola ISA assembly code and manually optimized Apple Pascal Code). That difference like with Multiplan/Excel vs. Lotus 1-2-3 first gave the advantage to AAPL and the hand-crafters and then, after some years to MSFT. Nothing of this is necessary anymore, one might add. 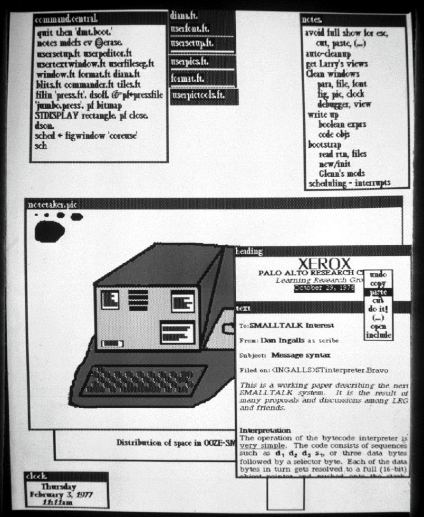 The very same reasons also caused the ancestors of both, the beautiful Xerox Alto, Dolphin and Dorado with their advanced Smalltalk, Cedar, Gypsy and Star interfaces (even had a now becoming mobile 3-line menu icon in 1981) to plummet to the bottom of the waters called market rules like a cannon ball. plink, 7 comments, praise or blame! Cherry: Yes, it is. Very high. And there was this flavor, other people probably talked about this, but it was group dynamics all going on up there. We were all up in the sixth floor. Although I think I worked mostly in my office and visited the sixth floor with questions, [inaudible] the sixth floor. But there was this attitude, there were all these little tools built, and it was the idea of pipes that just kinda, of stringing things together, that was all neat and wonderful. And there was this attitude that he who touched it last owned it. So if you needed PR (?) to do something PR didn’t do, and you went and added it, you now owned PR. And so if some other part of it broke, you owned it. MSM: You were now PR’s support. Cherry: You were PR’s support. Yeah, so a lot of the programs floated from person to person because somebody would add a feature to Sort, and they owned Sort. Somebody else would add a feature to Sort and then they owned Sort. Now that is, how open source was done at Bell Labs in the 70ies. Inside the corp. though, half owned by Western Electric and half by AT&T. Dig the spirit. Oral History at Princeton with Lorinda Cherry. RW: Well, do you - do you think that that as one of the successes of Silicon Valley, the availability of venture funds? DV: There is no question. It's very difficult. And over the years we've been visited by hundreds of people from every country in the world, almost all of the states in the country. They all want to figure out and clone what causes Silicon Valley to exist and thrive. Many or most of the visitors are interested in the underlying employment creation. But if you look at venture capital, it only works two places in the world. It doesn't work outside the U.S., and it only works in Boston, or the greater Boston area, and in Silicon Valley. Basically, almost no other major financial center in the world has ever generated companies of consequence and providence that is so large and visibly successful. And you can blame it on the weather. You can give credit to the great universities. You can explain that the venture community here is stronger and more experienced than other parts of the world. But the mystique of why it works is still very hard to narrow down to six or seven simple declarative sentences. And it - it is a local bit of magic that - works at this particular point and time. The duration of the venture industry is probably only from something like 1960 through the present, so you talk about not even half a century. It - it's still a new and - and sort of closet-like form of financial engineering. We don't think of it as investing at all. We think of it as building companies, often times building industries. And it's an entirely different mentality and attitude than in the traditional idea of buying and selling things. And this is not a place where you buy things; this is a place where you build things. And you participate in the founding team that creates an entirely new company and sometimes a new industry. And now there are far more practitioners. But if you go around the world, the Research Triangle in North Carolina was going to be another magic spot. Well, you can't name a great company, it’s never been started there. You can look at other centers. Seattle - well, there is a great company there. Maybe there are two great companies there - they include Nike. And - has anything happened in the last twenty-five years in that community other than Microsoft and Nike? And the answer is not a lot. Lot's of companies have started. Lots of things going on, but not a lot of monumental success. I mean it's unbelievable the number of companies that have gained prominence, have revenues of a billion dollars in this tiny, little valley. So it is a bit of enigma what all the ingredients are that everybody would like to clone and take away. I once tried to explain to the Deputy Prime Minister of Singapore who was here trying to take back the magic, and I said it's a state of mind. You can't take it back. Somehow or other you'd have to move your people here and they would have to have their DNA changed so that when they went back to Singapore, there was a DNA adjustment in the way they thought, the way they were willing to take risks. I mean in a place like Japan, if you start a company and it fails you're disgraced. Some people would commit suicide - if that happened. So weit wir es beurteilen können, sagt Herr Valentine die Wahrheit. Es ist ein Kreuz aber es ist so. Und das ist noch nicht einmal alles. Und jetzt ist California doch pleite, irgendwie. Wie sagt General Stillwell in Steven Spielbergs Film "1941"? This is not the state of California, this is the state of insanity. In a continuation of our policy on hinting to pre 2.0 computing professionals, today we have got Susan L. Graham. Mrs. Graham has received the 2009 IEEE John Von Neumann Medal. Past recipients of the Von Neumann medal include computing legends Donald Knuth, Doug Engelbart, and C. Gordon Bell. elimination-style algorithm for analyzing the flow of values in a program. Susan L. Graham is reachable through graham at cs dot berkeley dot edu. 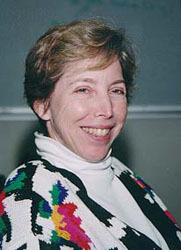 Known for taking her ideas through the full development cycle from practice to theory then back into practice, the results of Graham's work are widely used in practical compiler systems that convert high-level programming language code into the target language instructions used by a computer. She has promoted the development and distribution of widely used software throughout her career, and her service to the field has been demonstrated through her work on national committees and as founding editor of a leading programming language journal. Graham is the Pehong Chen Distinguished Professor in the Computer Science Division of the Department of Electrical Engineering and Computer Sciences at the University of California, Berkeley. In 1994 she was inducted as a Fellow of the Association for Computing Machinery. She is also a Fellow of the American Association for the Advancement of Science, and the American Academy of Arts and Sciences. She is a member of the National Academy of Engineering. 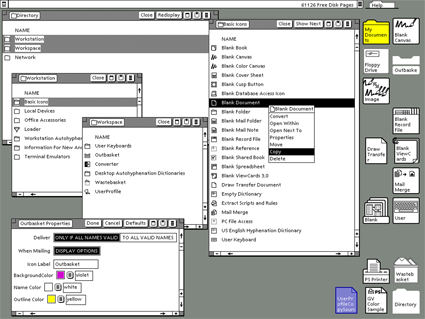 As a participant in the Berkeley Unix project, she and her students built the Berkeley Pascal system and the widely used program profiling tool gprof. ... She and her students have built several interactive programming environments, yielding a variety of incremental analysis algorithms.